Quick sidenote on another project I’m working on. Another collaboration with multitouch-hard- and software wizzard Johannes Luderschmidt, which is an interactive case-scenario tool for the police of the state of Hessen in Germany called Vispol. 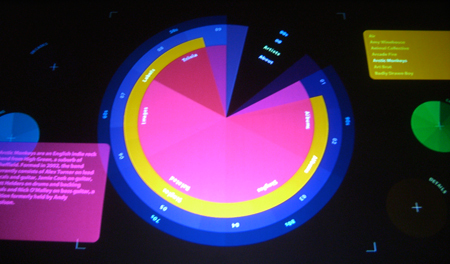 It was originally concepted and developed as a masterstudy by Johannes but is now a full-grown software for instant use on multitouch able surfaces. I created the design concept for this has-to-be-very-functional software and developed all the designs. And yes, it’s all circles again. Believe me, it was the best suitable form for this use. What you can see now is a movie about Vispol 1.0, but we’re already working on a design update, which will feature a much better contrast and signal colours. 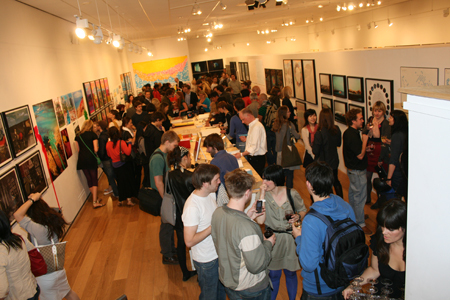 You can see all details about it on our collaborative website www.visactible.com. Finally another cut movie with the aim to show the functionality of the Digital Volvelles 2.0 application a little bit better. Hopefully there will be soon an online mouse-version to try it out. 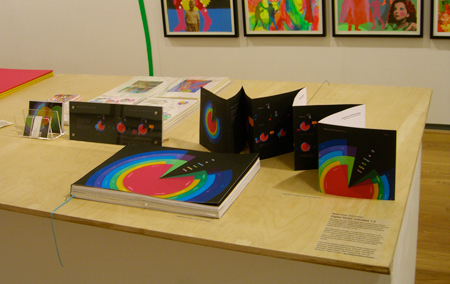 A new book has been published by “Die Gestalten Verlag” called “Data Flow” (9 Sep 2008). 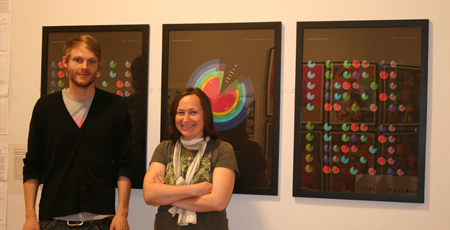 Its content deals with the visualisation of information in graphic design and the first topic of the book features the potential of circles as dataspheres. An older book that has pointed out the potential of wheels as a relevant model for modern interactive design even better is “Reinventing the Wheel” by Jessica Helfand (around 2002). 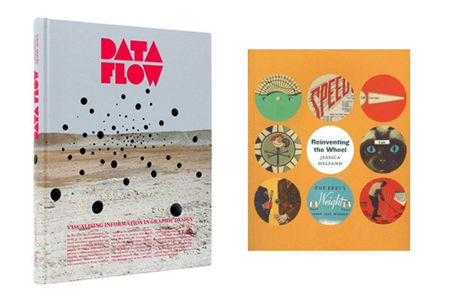 Both books are very recommended sources for any information/interaction designer. Finally I’m able to put some filmmaterial online. We’ve filmed the way you interact with the Volvelles on the touchscreen-table in a proper way too, but still have to cut and finalize it. So in the meantime you can see this quick-and-dirty made version. We are also working on a mouseclickable version for the web so everyone can experience the new retrieval interface and its system behind it. Stay tuned. 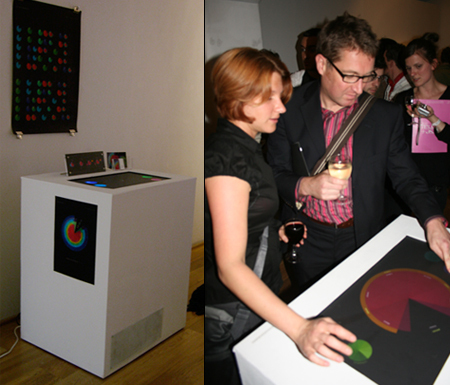 The private view was a real success for our multitouch-able self-built table with the Digital Volvelles interface (Please have a look at the ‘ABOUT’ section of this blog, if you want to know what it’s all about the Digital Volvelles). It was great to observe how people interact with it and how intuitively most of them had understood what they have to drag, touch, turn, etc. It has proven that the concept, the design, and the implementation work well together and that all the research and work has finally payed off. 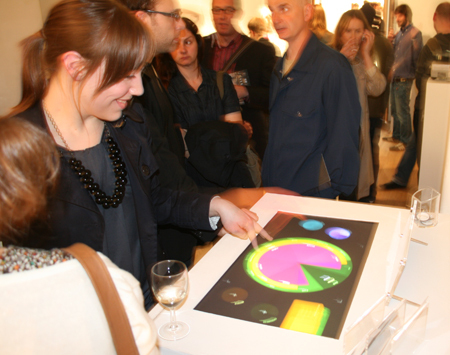 To get first hand feedback from the users was one of the best experiences during the private view and this will hopefully enable us to continue with the improvement of the interface and the multitouch-table. 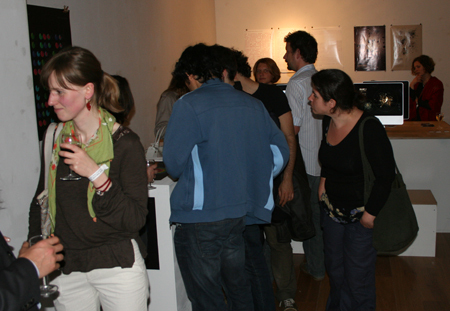 Thanx to everyone, who could make it to the show. It was a great evening. Supporting print material. 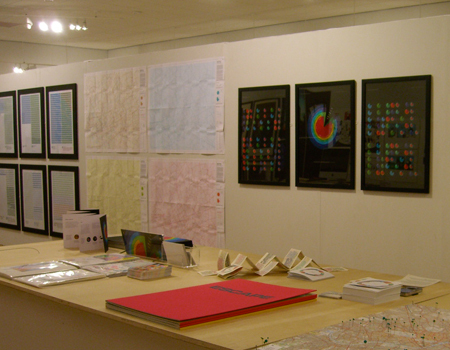 After all, I’m a communication designer with an affinity to information design! 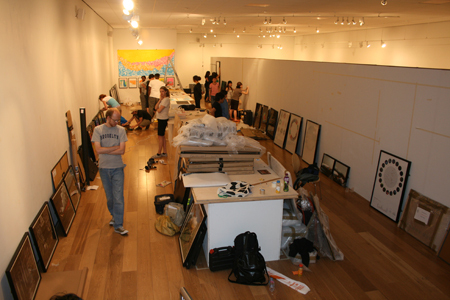 The set up for the Central Saint Martins Final MA Show startet at 8am sharp at the Mall Galleries. 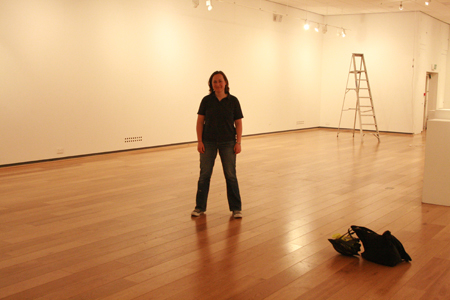 Within 2 days the whole show was set up. 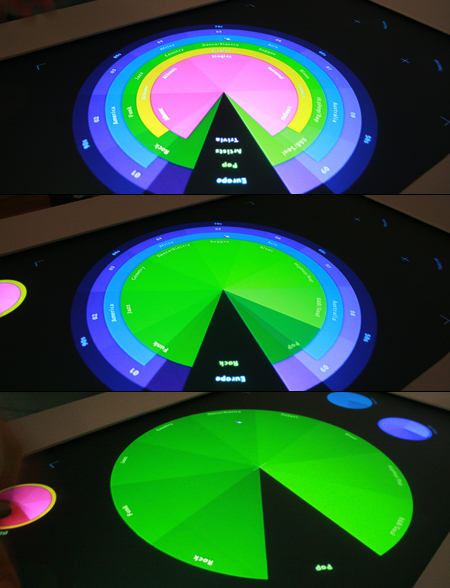 Our multitouch-able table with the Digital Volvelles interface had to face some problems with the gallery lighting, which was interfering with our LED-sensorial movement tracking of the table. 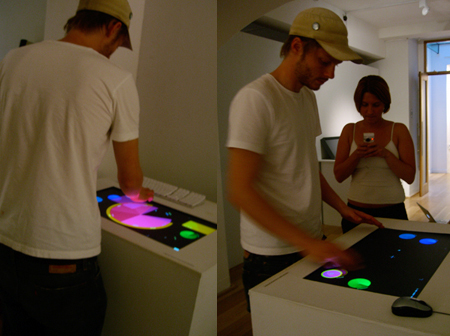 It took a lot of attempts, patience, and staying power until we realized that also the reflecting light off the white gallery walls was interfering with the multitouch-table. The light temperature of the bulbs was too warm. 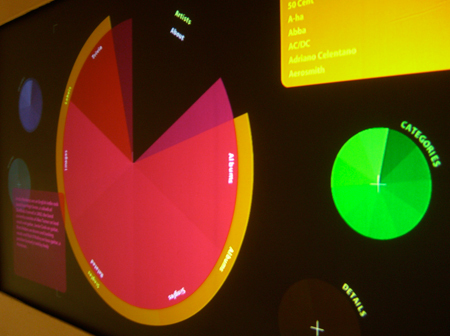 The touchscreen functioned without any problems in a brightly lit room where ‘cold’ artificial neonlight was used. 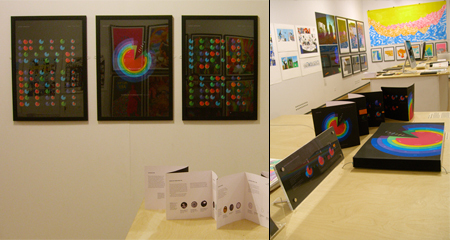 Again, a new thing we learned, even on the spot of an exhibition. Johannes might now turn to laserlight for table version 2.0.